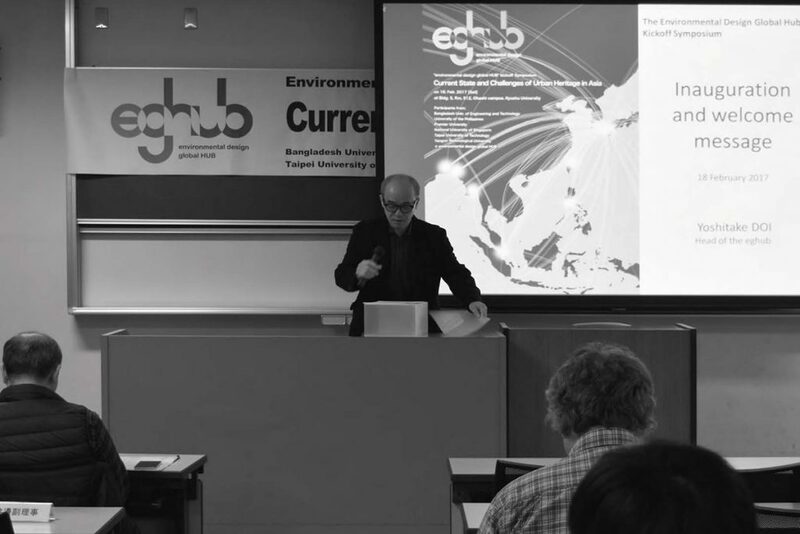 Introduction of Environmental Design Global Hub by Prof. Yoshitake Doi, at the Symposium on 18. Feb 2017. I would like to introduce our newly launched eghub, together with the underlying aim and concept. It has almost been 50 years since the Department of Environmental Design was first established. Under the philosophy of design as a humanization of technology, we have placed prime focus on environmental projects from the perspective of “humanity” and “society”. Our research and education on design have been developed by integrating the fields of landscape, city and architecture in a cross-fertile, comprehensive and creative manner. The hub is involved in the environment from the perspectives of humanity and society where researches are conducted in such a way that would eventually contribute to the environment of the Earth; especially for Asian region. In this regard, the Japanese support for developing countries, or the framework of the UN’s Sustainable Development Agenda 2030 etc. are indispensable. At this point, I would like to review some of the explorations on Asian architecture by Japanese researchers. Some of the first full-fledged researches after the War appeared around 1980. It was a period when Professor Shuji Funo, who later became a professor at Kyoto University, initiated Asian research and conducted survey related to kampongs or slum neighborhoods in Indonesia. Among the Japanese scholars, he won pioneering status in postwar Asian studies. Ten years later, Professor Terunobu Fujimori from the University of Tokyo obtained a sizable research funding good enough to send many young researchers to Asian countries, in order to carry out their foremost mission in making a list of local modern architecture and so on. Many of these students and assistants at that time, went on to become professors. They eventually played central roles in Asian studies, and dominated the academia. Though not direct disciples of these professors, their influence incite our approach. But what differs between our approaches is where we focus not only on architecture and planning but also on landscape; mainly because of its linkage to humanities and social sciences. Among my colleagues, Professor Tani, a cultural anthropologist, works on the issue of arsenic contamination of groundwater in Bangladesh. For this research, he was awarded the grand prize from the International Development Organization for Higher Education. He focused ingeniously on the community cooperation to manage and maintain the local wells that are their only water source. Professor Kondo, though a social thought historian, revealed the actual condition and pointed out the importance of community leaders in deprived areas in northern Thailand. Professor Tanoue and Professor Asahiro are both surveying the resilience in disaster-hit areas in Japan from the standpoint of architecture and landscape respectively. In the process of reconstruction, they argued that the community needs to enhance its self-help activities. Professor Tanoue is also studying community policy in the slum area of the Metro-Manila, Philippine. According to him, the national policy of making communities was successful in establishing the self-helping and participatory feeling in the mind of people that led to numerous housing activities. Professor Fukushima is studying the sacred construction activities of church facilities by Hong Kong Catholic Church. There, the laity participate in the construction process.The laity, based on a modern definition, found themselves the subject of faith, not missionary objects, and in the new relationship between the sacred and the secular, develop construction activities as a representation of their faith. These studies reveal the importance of the role played by humanity and society in the environment. In the Japanese society, participation practice had already been proven to be valid 50 years ago. As such, Professor Tanoue points out the need to advance to the “empowerment” stage, superseding the “participation” approach so far. Man is not only an object formed by the environment, but also an entity that designs his environment. This may be the starting point we all need to share. However, we are encountering difficulties. We are now in a contradictory phase of the anti-globalism, or the revised globalism in the process of globalization. This trend originated in the financial crisis in 2008. As Professor Iwamoto mentioned, the Dutch architect Rem Koolhaas declares that he will work on country-sides rather than big cities, while Toyo Ito says the Japanese provincials are also the forefront of globalization. The next decade of antiglobalization is anticipated to be very challenging. I’m a bit dubious about the economic benefits that the upcoming Tokyo Olympic Games will bring. The truly critical year may be around 2030, in other words, the aftermath of it. The second agenda is education. Through environmental design curriculum, I would like to nurture our students as global citizens. At the moment, several international workshops have been conducted, as listed in the eghub brochure. We are seeking for a so-called “global” attitude that respond regionally and locally on a global basis, crossing borders in order to make the regions collaborate one another at global level. Perhaps, we maybe engaging this area as a late comer as international workshops are not unusual today. However, based on my experience, we can engage in exchange workshops simply by transferring our curriculum abroad, and implementing it through overseas teachers and students. In this way, we can mutually develop and refine our pedagogical skills. In addition, it is also important to view and verify our pedagogy through a bird’s-eye view. In so-called developed countries such as the United States, France and Japan, the fundamentals of the building & construction education was modernized in the 1930’s. In short, it was an architectural education by modernists. However, I understand that the pattern-language theory established by professor Christopher Alexander of the University of Oregon from the 1960’s to 1970’s, in particular, had exerted great influence on Asian countries. After all, it was a way to understand our planet. If we examine what kind of architectural education we have, and how architectural education is distributed to the many parts of world, I may be allowed to imagine if another education will emerge around 2030, just 60 years after Alexander. Assuming that there is a 100-year cycle, one may imagine that an alternative trend may emerge somewhere around 2030, that too, is just 60 years after Alexander. Closely related to education is “Architects’ profession”. Currently, international organizations like the UIA (International Union of Architects) are promoting the standardization of architect qualifications. In this aspect, I think that Japan is lagging behind Asian countries. Yet in a couple of years, our eghub will be ready to train UIA internationally qualified architects. I think that our hub will provide a better platform to share with you. For global education, studying abroad is not enough. Each student has to have a certain perspective on what global means, something about our planet. Today, many researchers mentioned “urbanization of the whole Earth”. Perhaps after 2030, it will certainly be a serious problem. It is not a novel perspective in particular, but rather, a very common recognition, which therefore provides an effective departure point. It is said that in the future, 80% of the Earth’s population will be part of the urban population. By then, the human literacy rate approaches 100%. Predicted by French Demographer, Emanuel Todd, this future is envisioned to be somewhere around 2030 and no later than 2040. Apparently, the 100% literacy rate includes all the women on this planet. As women education level, knowledge, self-consciousness rates get higher, the human birthrate declines. As a natural consequence, the Earth’s population will decrease. Similar scenario is shared by the Future Earth, drawn by Japanese Institute for Global Environmental Studies. This figure depicts “Percentage of urban population”, so to say, the urbanization rate. The whole East Asia will be urbanized in the near future. It is a driving force for urbanization of the world. That means, there are a lot of potential for business opportunities, as much as the emergent of a variety of problems. In my personal opinion, the urbanization of the earth “continues the endless and eternal redesign of society”. One should remember that the Industrial Revolution and the Political Revolution in developed countries is accompanied by both an urbanization revolution and social reform. I should mention that it was not until the 19th and 20th centuries that sociology was born, the concept of society was invented, and various concepts such as utopia, association, community, and Japanese neighborhood association even were introduced. Even in Japan, the notion of family changes every twenty years: feudal family, nuclear family, new family, family annihilation, bonds, share house, etc. People ask oneself which place to live, where to live, as well as who to live with. The endless transformation of society is becoming an increasingly serious issue in the 21st century. In this sense, it is more important to have a bird’s-eye view of the Earth. We can have important barometers, such as “Global city” that Sasquia Sassen claimed its importance, “National income”, “Economic growth rate”, “Tourism” (Other Asian countries are more active than Japan), “Primary education” (until human literacy rate reaches 100%), “Birthrate”, “Smartphone penetration rate” and “Internet penetration rate”. These, are just some examples. In order to train students to be a global citizen, we need to provide them a certain global framework and a certain world model. But how? Finally, the third agenda is to build a network. The bird’s-eye view from the satellite is certainly useful as a means. But that alone is not enough. For our faculty members, the question of how these earth images are presented to our students matters. This is because the ground which is captured through bird’s-eye on the artificial satellite inevitably leads to a double recognition; the ground that is viewed by us and the ground that we lived on. So, we must somehow connect the knowledge gained by this bird’s-eye view to the relationship between people on the ground and their everyday life. Since our establishment, we have established numerous partnerships with universities, departments, and individuals in more than 10 countries. In line with this practice, and in order to further intensify and enrich our research and education, we aim to share our activities with oversea schools. The network is intended as an open platform for every member. That will be the basis for perceiving the Earth as the view from a global citizen. During the formative years, students will get to know their foreign peers through this platform. As they build their career, they may begin to play an important role in their home country, and above all, they may build a fertile collaborative relationship through this foreign network. Professor Tani proposed the “hundreds of customers” concept. It may sound optimistic but it was intended as part of the hub’s philosophy and his own aspiration. The concept is related to a “lucky cat”, a traditional votive figure that is supposed to attract a lot of luck, money, and people. While network was once built through ships and railroads, and in the present time via internet and e-mail. Though network brings people closer, but cyberspace remains merely a means to do it. The following exchanges are expected to provide us a whole new aspect and perception of the Earth. When launching the Environmental Design Global Hub, the definitions of the words “environment” and “design,” were already self-evident. Still, the definitions of the word “globe” or “global” remain unclear. Although there’s only one globe in this universe, it is becoming ever-diverse and ever-complex, just as men and society are. In this sense, the globe is what we are.